The release date is a bit delayed from it should be. My son was hospitalized for 4 days last week because of dengue fever (mosquito caused-fever), I had to frequently commute from my home to hospital. Now he's already healed and play again. This part 2 consist of arm parts. I didn't add any articulation on this model for this time, I made it as a statue with fixed parts. The parts number are the same both left and right, so you better watch the label on top of the pattern's page and the assembly instructions are for the left arm. The next part or the final part will be its hip and legs. The first part of 3 parts planned. 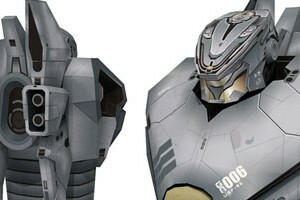 This is the torso part of Pacific Rim movie Jaeger from Australia, Striker Eureka. 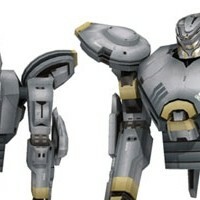 Actually Striker Eureka is not the main star in the movie, it's only supporting the Gipsy Danger Jaeger. 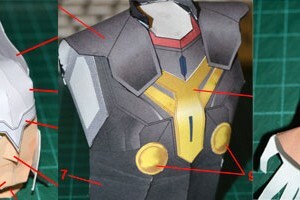 But for me, Striker Eureka design is cooler than Gipsy, so I made it first into paper model template. Don't worry Cristiano are now working on Gipsy Danger template. The complete model will has 60 cm height. Although it's quite big I made its parts relatively easy. I just play on its texture to make it more detailed look. I use the same technique as the detailed Optimus Prime template for drawing Eureka textures. The template itself contains 16 pages of patterns. While friends in United States have fun with their football match on superbowl, this paper craft is also related to football :). 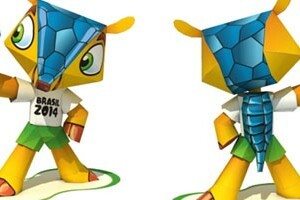 Perhaps it's too early because FIFA World Cup is still a half year ahead in Brazil, but I just found out Fuleco the FIFA World Cup 2014 Mascot, was firstly announced to the public in 25 November 2012, so I think it's alright to release it now. Fuleco means Football and Ecology. I often see this Fuleco on many ads on products which sponsored this big event for football lovers and especially our friends in Brazil. The template itself is only 2 pages, the parts are quite easy to assembly. More amazing paper model from duo Cristiano Luis Dias and Suraj S Prakash. 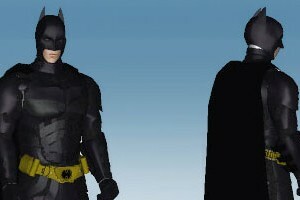 Now they made a template of Batman from The Dark Knight Rises movie version. The scale was not stated in the beginning, so I measure the template resulting in 1:5 scale with real Batman height on 190 cm. The finish model will be 41 cm from the base to the tip of Batman bat-ear. A bit bigger than usually made in 1:6, but due to some of small parts on the template, the 1:5 scale is just fine. The 3D model is well made, the figure posture is just perfect plus a believable texture added by Suraj make this model worth to try. I renamed Crysis category into Figurine category, and gathered all figurine paper model I've ever made and made by guest designer as this new post. This Thor paper figure template was submitted and designed by Christoper Ryan (Bamboogila Corner). He said to me that he wanted to put some of his works to be hosted in Paper Replika, this model is for a start. The template contains 8 pages of patterns in PDF format with no password. He made a detail step by step build photos as the assembly instructions, but he didn't include the completed photo in the attachment, perhaps tomorrow I will add it if I can got it from him. The scale is 1/6. This figurine also comes with a display stand included on the template.